Scabiosa, more commonly known as pincushion flower, is a short-lived perennial plant that is sometimes grown as an annual. It is native to Europe and Asia and is typically grown for ornamental purposes. Scabiosa is valued for its flowers, which are borne on the end of long stems and appear in colors of white, pink, red, yellow, blue and violet, depending on the variety. Scabiosa blooms in late spring through mid-fall, and the blossoms are prized as cut flowers. The plant's common name derives from the gray stamens that protrude like pins from the flower, or cushion. 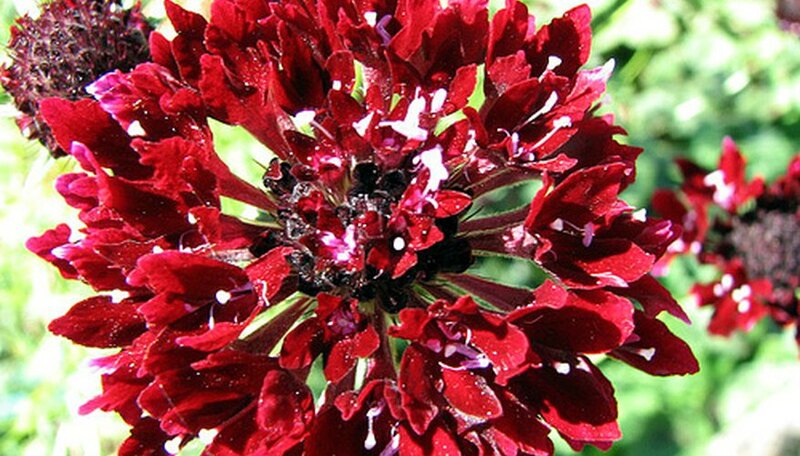 Plant scabiosa in an area that receives full sun to light shade and has well-drained, slightly alkaline soil. Dig a hole of equal width and depth to the container in which the plant was previously grown. Set the plant inside the hole and gently cover the roots with soil. Space plants at least 12 inches apart for the best results. Water scabiosa plants just after planting to settle the soil. Continue watering once per week to keep the soil moist. Watering twice per week may be required in very dry climates or during drought-like conditions. Do not water on weeks that receive more than one inch of rainfall and avoid over-watering, which may cause rot. Feed scabiosa using an all-purpose granular fertilizer in spring when new growth appears. Follow the manufacturer's instructions for proper dosage and application. Water thoroughly before and after applying to prevent root burn and to distribute nutrients. Spread a layer of organic compost around scabiosa plants in early fall to increase the fertility and alkalinity of the soil. Cultivate the compost into the top inch of soil using a garden spade, but be careful not to damage the roots of any nearby plantings. Remove dead flower heads regularly to prolong scabiosa's blooming period. Remove the entire flower along with the flower stem and discard. Flowers will continue to appear throughout summer and into fall if spent blossoms are removed quickly. Divide scabiosa plants once every three or four years in spring, or they will gradually decline and die. Dig up and slice the crown of each plant into two or three pieces with a sharp garden spade. The crown is the area where the stem meets the roots. Transplant the sections immediately and care for them accordingly. Scabiosa may also be started from seed but will bloom much later. Sow seeds directly into the garden after all danger of frost has passed or start indoors four to six weeks before the final frost in your area. Add lime to the soil to increase alkalinity if necessary. Purchase lime at a home and garden store and follow the manufacturer's instructions for application. Check alkaline levels by using a soil test obtained from your local county extension office.